Just sending a shout out to Pure Luxury Transportation for their tenth year of partnership with the Sonoma Valley Vintners & Growers Association! What began in 1991 as a chauffeured ground transportation business with one vehicle, has blossomed into the premier Bay Area transportation provider with the 17th largest fleet in the United States. Gary and Jennifer Buffo, owners of Pure Luxury Transportation, have been consistently dedicated to our local community while their company continues to grow. Pure Luxury Transportation is dedicated to supporting SVVGA’s programs so that we can continue to increase consumer and trade awareness and subsequently, the financial value of wine grown and made in Sonoma Valley. Not only is Gary Buffo serving as a Board Director, but Pure Luxury is proudly supporting many of the SVVGA programs such as the monthly Concierge Tours, Reserve Sonoma Valley and Sonoma Wine Country Weekend. Best of all you can reserve your own personal Sommelier Tour, featuring myself, with Pure Luxury Transportation, offering explorations in various locations throughout wine country. Schedule your adventure with me by calling 800.626.5466 today! 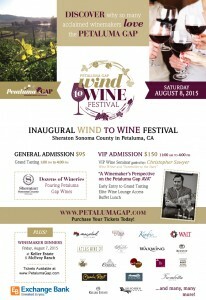 Yes, I have been keeping rather busy and it just continues, this weekend it will be the inaugural WIND to WINE Festival hosted by the Petaluma Gap! The fun starts Friday night August 7th with two wine dinners at Keller Estate & McEvoy Ranch. 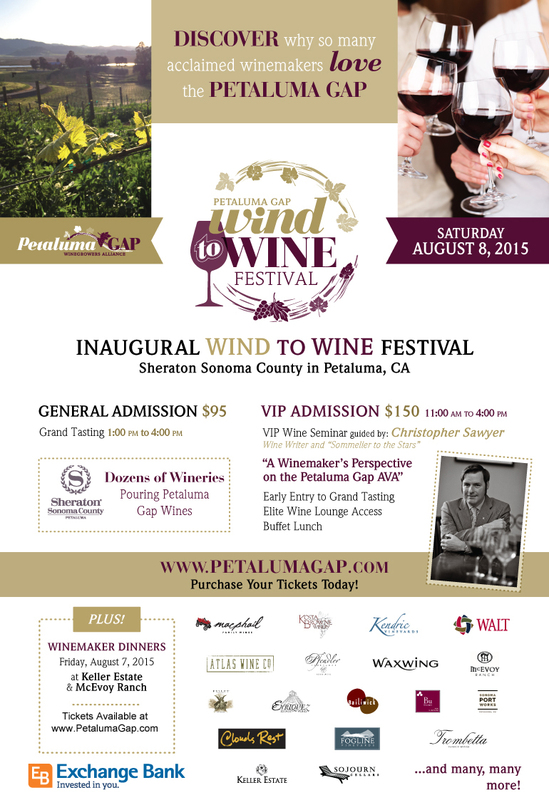 Then at the Sheraton Petaluma on Saturday, August 8th there will be more than 60 wines available for tasting as well as a VIP Seminar “A Winemaker’s Perspective on the Petaluma Gap AVA” hosted by ME! More information at the Petaluma Gap website. Almost back from my European cruise and jumping right into things with an event at Morimoto in Napa! 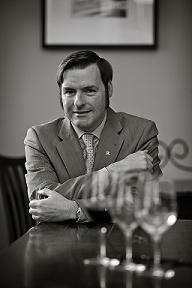 I will be the Guest Sommelier at Sake Drinker with Morimoto Beverage Manager Eduardo Dingler, Monday July 27th at 5:30. For reservations & info visit the Tout Suite Social Club website. What is ZigSaw? It’s when Sawyer Somm and Ziggy the Wine Gal get together to talk about their favorite subject! Keep an eye out for our show on Allvino.com starting in August 2015. Korbell NV Blanc de Noirs Sparkling Wine, California ($11.99) One of the most intriguing sparkling wines around! Unlike most Blanc de Noirs, which are made primarily with just Pinot Noir grapes; this magnificent new release has smaller portions of three other flavorful red grapes varieties: Zinfandel, Gamay and Sangiovese. As a result, the wine has lively flavors of raspberry, strawberry and cherry; soft, spicy notes of ginger, cinnamon and nutmeg; and a long, enchanting finish that makes you want more! SawyerSomm Pairings: Great wine to serve with brunch, especially with Lox & Bagels, fresh fruit and tangy salads; for lunch, think chilled soups, BLTs, turkey sandwiches; and for dinner, salds with goat cheese and berries, tuna tartare, salmon, sushi, pork with fruit chutney. Thirty-Seven 2013 Albarino, Paradise View Vineyard, Sonoma Coast ($22) Crisp, dry and refreshing wine with fresh aromas of summer flowers, melon, citrus, and mineral. Lively flavors of Meyer lemon, lime peel, cantaloupe, white pepper, and a burst of bright tangy acidity on the finish. SawyerSomm Pairings: fresh oysters, Ceviche, spring rolls, fish tacos, and grilled chicken with zesty lime aioli. Trattore Farms 2013 Roussanne, Estate Grown, Dry Creek Valley ($28) Blended with a small portion of Viognier, too. This dazzling medium to full bodied wine has lovely aromas and bright flavors of white peach, ripe melon, fresh squeezed grapefruit, hint of apricot, vibrant acidity and lush creamy texture. SawyerSomm Pairings: Medium cheeses, guacamole, Heirloom tomato salad, peaches and citrus, poached scallops, sea bass, pasta with tangy white sauce, and lemon chicken. Acorn 2012 Dolcetto, Alegria Vineyards, Russian River Valley ($35) Dolcetto is best known for being one of the flavorful red grapes grown in the Piedmont region of Italy. Through the years, Acorn Winery in Healdsburg has made one of the finest offerings from the United States. Not surprisingly, this new release did great against selections from around the globe at the San Francisco International Wine Competition 2015. Captivating notes include: lofty aromas of wild berries, citrus peel, cocoa and spice; vibrant flavors of fresh-picked blackberries, blueberry, boysenberry, black pepper, espresso, and roasted walnut; tangy acidity; soft texture. Alluring, playful and generous. SawyerSomm Pairings: Salty cheeses, especially parmesan or Vella Dry Jack; pulled pork sandwiches; grilled veggies, Ahi tuna with Espresso Rub, pan-seared Liberty Duck breast; gourmet sausages and juicy burgers done on the grill. McEvoy 2011 Red Piano, Estate Bottled, North Coast ($35) Gold Medal winner at both the San Francisco International Wine Competition 2015 and the North Coast Wine Challenge earlier this year, this wine is all about Mediterranean delights. Made with a selection from special blocks of Syrah, Grenache, Montalpuciano and Refosco planted at the McEvoy Ranch south of Petaluma, the wine features lovely aromas of red fruits, red apple peel, blood orange and spice. On the palate, the flavors are layered with notes of dark cherry, pomegranate, licorice, white pepper, and fresh herbs. SawyerSomm Pairings: A dazzling picnic wine, especially when paired with a selection of local chesses, charcuterie, baguette, fresh berries, roasted nuts, cured olives, and McEvoy Olive Oil. Other tasty pairings include grilled fish with savory herbs; pasta with hearty red sauce; pomegranate chicken; lamb sliders; sweet & sour pork; baby back ribs; and grilled red meats. 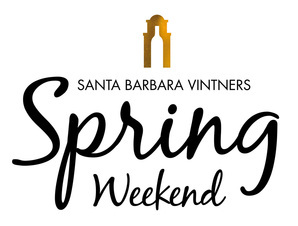 The Santa Barbara Vintners Spring Weekend and Festival is nearly here and tickets are almost sold out for the Friday night Vintage Party and Saturday morning wine seminar. First join me at the Vintage Party, a traditional La Paulee style dinner hosted by the Santa Barbara Vintners and Mattei’s Tavern to welcome Spring Weekend visitors to Santa Barbara Wine Country on the evening before the Festival. In the La Paulee tradition, attendees will bring their favorite Vintage 2009 or older wine from Santa Barbara County or beyond to share. Next I will be moderating this engaging wine seminar on Saturday morning before the Festival at the Santa Ynez Valley Marriott. 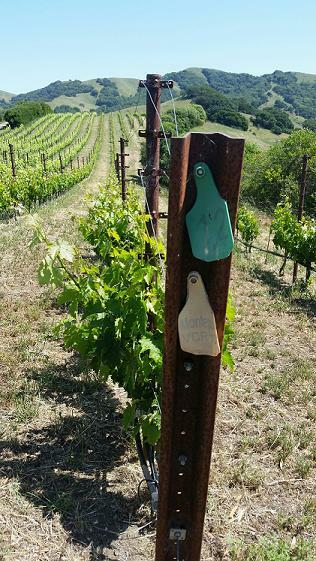 This year it will feature winemakers whose wine careers were influenced by their time working at Zaca Mesa. 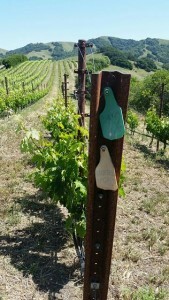 Want me to join your group for a specialized Napa or Sonoma wine tasting extravaganza? Now you can book it with Pure Luxury Transportation, the exclusive transportation venue to enjoy an extravagant Wine Country adventure! This adventure offers the opportunity to have me answer your questions about wine, grape varieties, winemaking techniques, and the historic winegrowing regions of Northern California’s Napa and Sonoma Wine Country. This memorable experience would features special guests along the way including winemakers and winery proprietors.